It’s not, however, his best album. Unlike last year’s All Eternals Deck, on which each song could have stood on its own as a future compilation entry, Transcendental Youth trades discrete for discreet. The first hint is the reliance on piano. With the exception of 'White Cedar,' in which trumpets herald the character’s gritted-teeth triumph, experiments with horn arrangements like 'Cry For Judas' and the title track come off like screenwriters 'opening up' stage plays. Darnielle’s magisterial gift for commands as aphorisms, which peaked on All Eternals Deck's 'Beautiful Gas Mask' ("Never sleep, remember to breathe deep"), matters less this time than narratives in which characters endure the grueling duty of bearing witness. Fortunately Darnielle’s learned enough about dynamics and rhythm sections to lend 'Lakeside View Apartments' the grimness of his beloved influence, Gaucho era Steely Dan: a sense of dust motes spinning in streaks of sunlight, a vertiginous suspension before the lines, "And just before I leave/I throw up in the sink." These suburban kids getting their kicks where they find them reach closer to Ann Beattie than, say, Denis Johnson: good times before a beloved friend ODs or a marriage dissolves; songs fade as their outlines become clear. It’s the delicacy of these elisions that have made fans draw breaths for two decades. On Transcendental Youth, however, the outlines look like limits. Shades of Gaucho’s 'Third World Man' spook 'In Memory of Satan,' about a recluse coming to love isolation, the brass section swelling to match his confidence. If the track works, credit Darnielle’s confidence in his thin, high voice and querulous tone; it shades his narratives with skepticism. It does more work than necessary. Short on melodies commensurate with his mastery of both suggestion and accusation, Transcendental Youth is prime headphone bait, where Darnielle's voice and lyrics get the scrutiny they deserve. 'The Diaz Brothers,' though, deserves to become an audience favorite: a galloping rocker set to piano about a pair of criminal lowlifes. It’s worthy of Zevon and if FM radio looked like 1977 would deserve to be a hit. Even better, it’s a crystalline example of what Alfred Kazin wrote in praise of Kafka: the unreasonableness of things made totally believable by his humility of language. 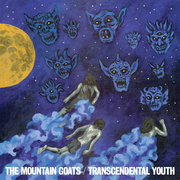 On the whole, though, call Transcendental Youth a stumble and wait for the next Mountain Goats release next year.